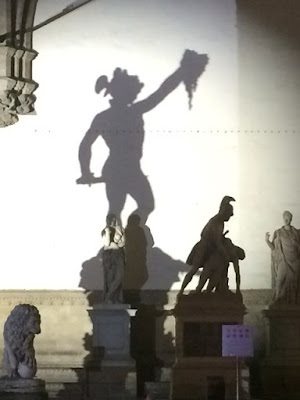 The shadow of Benvenuto Cellini’s sculpture of Perseus holding Medusa’s head is cast triumphantly on the wall. And was it not also for the shield that the goddess Athena gave to Perseus, that he could sever Medusa’s head? Is such reflection a kind of indirect contact, that tells us something about our own eyes? The myth tells that everything which came into direct contact with Medusa’s sight petrified, even after her beheading. As miraculously, from her bleeding neck she gave birth to two other creatures, Pegasus and Chrysaor. For the idea of myth is to continue, indeed the force of Greek tragedy reflects on those who have grown up in its shadow, until this present day. Such stories have shaped generations, and we ourselves are shaped by stories we may not even have read or heard of. Romanticism, for instance, didn’t take place in Africa, which partly explains how love is perceived within a completely different coding in the West. Similarly, Indian philosophy stimulates a distinct view on life and the Taoist another. Humankind has searched for meaning, and meaning stems from what happened before us, whether completely invented or not. Through our eyes, we see a past which we are very often unable to recognise, and without recognition, how can we deal with it? Often we see as in a mirror, although we do not see the origin of the image. You might mistrust someone for the look of one’s eyes more than their words or actions. And friendly eyes make you feel comfortable? Such impressions are generally not much our own creation. They were passed on from generation to generation. Terror is similarly conveyed, and the Ancient Greeks have been masters in paving the path. We have woven our lives in oblivion. When we seek to find meaning, the effort is to understand what is there. And what is there is filled with symbols that seemingly hand us meaning. We become immensely stimulated by a specific agglomeration of symbols that we make meaningful while their randomness is overlooked. We give deep attention to a particular combination of images and thoughts whose impressions are immediately accessible to us. Certain gestures, phrases, ideas, and emotions are highlighted which we do remember indeed. Everything we do remember detaches from all other experiences, yet all together they weave the tapestry of our lives. This is the complexity of memory. Everybody builds up memory in different combinations. What we keep consciously present in our mind tells us how to react, how to pick up a concept, how we feel. We react on what our mind and body have memorised, though not all that is memorised is recalled. Then, to see our memory as a minor part of a vaster landscape which is not remembered does not sound that illogical. Nor does the notion that oblivion includes everything from which we do not draw conclusions, although the tragedy might just be that this is not that true. Turning back to the picture above, Benvenuto Cellini’s sculpture exposes a rather violent historic representation. Likewise the other exhibited sculptures by various artists. Today their elevated greatness in the history of art confuses famous names with underlying stories which are represented within the sculptures. The symbolism which reaches out to offer us insight into our current being, ‘a touch into oblivion’, is generally overlooked. Today, a fair amount of literature and film marches on the key element of tragedy to entertain us. Creating tragedy seems to come naturally to us. Yet indirectly we give meaning to something that was created long before we were there. The shadow in the picture reminds us how reflection indirectly connects us to oblivion, how oblivion can make us act, and is triumphantly present, silently exhibiting its influence. As this statue by Cellini moves far beyond its time, backward as forward, it is properly charged with oblivion. And this is the art of seeing, the force of myth, that we all carry along. I have shared with the author a personal experience. In my youth, I lived in Pacific islands. Today I find myself still saying 'Yes' with a Pacific gesture, which no Westerner understands. I think the post is both important and true. The trouble is that, things having passed into oblivion, how should we ever understand them? Or is it sufficient merely to understand that they exist? "oblivion includes everything from which we do not draw conclusions, although the tragedy might just be that this is not that true"
Dear gentleman, we carry along an incredible amount of ‘data’ and even when we do not connect with all this ‘information’ directly, somewhere it is ‘stored’. We are the most ‘sophisticated computers’ walking around, just in lack of a manual. I guess one should take some time to optimize the use of it. When we draw conclusions par force we are forgetful about an enormous amount of information that makes us think in a certain way. I think the difficulty for many people is to understand that we are more than what we think we are, but we are not who we think we are. I feel that one gauntlet we navigate is in avoiding what I’d call ‘mythologising myths’. By that I mean assigning undue importance to myths — to their presumed content-value and truth-value. Myths may well enrich culture, and on occasion, even point us toward some eternal insights into human nature. However, myths, through their often-fictional unreality, may also be given unearned consequence and, at worst, mislead us through outdated assumptions. In that sense, I suggest that myths to a degree pose a risk, if we allow them to ‘shape us’ indiscriminately. The article does not claim that myths are the cause for our understanding. Rather it proposes a view where things move beyond their literal interpretation and show more to us than we habitually might imagine, that we carry along many things we do not recall, but therefore are not less intrinsic to our being. It’s a sensitivity towards developing thought. True or untrue, just look at how many thoughts human being embraces while being oblivious where these came from. When thoughts come into existence, from that moment on they carry their truth, even in being untrue. ‘[J]ust look at how many thoughts human being[s] embrace while being oblivious where these came from. When thoughts come into existence, from that moment on they carry their truth, even in being untrue’. The preceding quote, Tessa, carries interesting, but also certainly provocative, ideas. Let me tease out just three: human beings ‘oblivious’ to where their ‘thoughts came from’; ‘thoughts … carry their [own] truth’; thoughts ‘carry their truth, even in being untrue’. Novel, at least, in terms of what constitutes thorny matters like truth and untruth, reality and unreality, belief and unbelief, facts and fiction, perception, sources and (un)reliability, and context and awareness. A worthwhile discussion, Tessa; thanks for bringing all this to the fore.